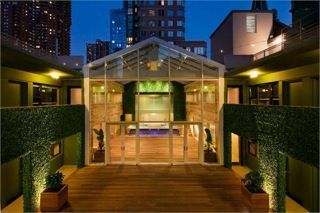 Located in Manhattan’s Hell’s Kitchen, the epicentre of gay life in New York City, The Out NYC is the city’s first straight-friendly, urban resort. Freshly opened in March 2012, The Out NYC prides itself on offering guests a truly unique experience; one enhanced by a new audio system designed and installed by NYC’s EL Media Group and powered exclusively by Lab.gruppen C Series amplifiers. EL Media Group’s central focus is providing luxury sound for luxury properties utilizing custom created musical programming and high-end audio systems. Working closely with The Out’s architects and designers over the course of 2011, EL’s creative chief operator, Ernie Lake, designed a distributed audio system incorporating 36 loudspeakers powered by one Lab.gruppen C 10:4X and two C 10:8X amplifiers. Additionally, the system incorporates EL’s proprietary 3.1 Player, which allows The Out to stream up to four distinctly different musical programs – that shift between various musical genres over the course of the day to reflect the evolving mood and usage of a given space – to multiple zones of the hotel. As the vendor of choice for The Out NYC, EL Media Group are currently working on an additional audio system for the hotel’s dining area, which will also include Lab.gruppen amplifiers.